Stephen King adapted his own 1983 novel for this 1989 horror movie, and while it's a story which works well in print, it doesn't quite translate to screen as well as it can be imagined from the original material. 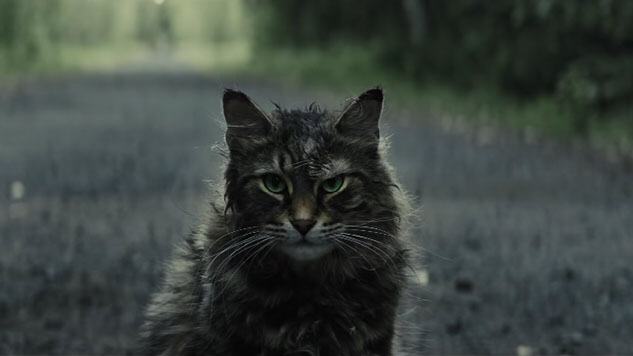 Since it's Stephen King, it's obviously going to take place in New England, where a family relocate from Boston to a rural house on the edge of the woods, and soon after moving in discover a Pet Sematary (sic) on the edge of their property. They become friends with Jud, an elderly neighbour, and when the family's pet cat dies as a result of being hit by a truck, Jud leads the father of the family beyond the pet graveyard to bury the animal in an ancient Indian burial ground, a place of eerie supernatural power which brings the cat back to life, however, it comes back much less domesticated and far more feral. The rest of the story gets into spoiler territory, and though it's an effective scary tale, the execution is quite poor, ending up more cheesy than it is scary, particularly in the final act and certainly not helped by performances of a soap opera standard (Fred Gwynne aside), and it's directed without any real flair or identity. A title song by The Ramones featured, and while it isn't actually a bad song, in the context of the film it really doesn't work at all. It's fair to say that it was hampered by production limitations of the late 1980's and has dated rather poorly, which makes it quite understandable that a remake emerged 30 years later. 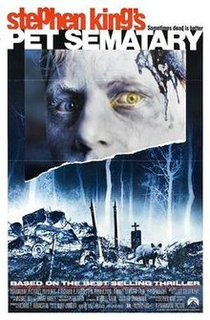 The 1989 version of Pet Sematary was adapted by Stephen King himself and it's fair to say that it's probably amongst his lesser works as an adaptation from his novels (certainly when compared to others). For me, it isn't a terrible horror film, but it has dated quite terribly, especially with its cheesy acting and execution, but it is a good story with a little more depth than your standards scary movie, raising questions of morality surrounding death and the thereafter. 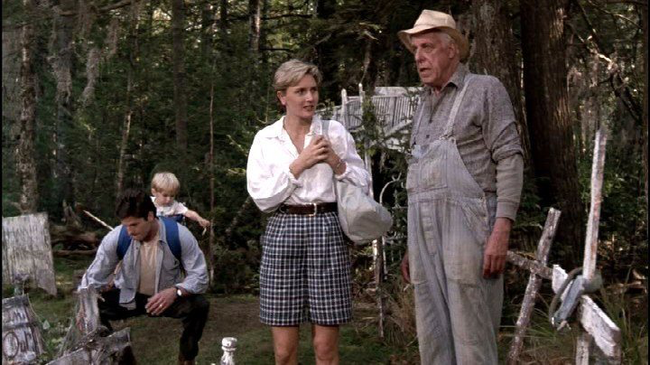 The story sees a typically idyllic family relocate from Boston to Maine, where their new house borders woods containing a Pet Sematary (sic). 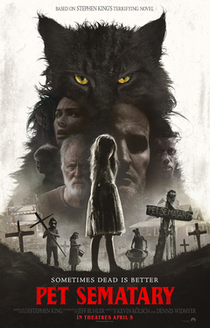 The family all experience supernatural happenings and when their pet cat dies, the father is taken by an elderly neighbour to an ancient Indian burial ground to bury the animal and the next morning the cat returns to life, though it is much more feral than it was prior to its death. The second half of the film does deviate from King's novel and the 1989 version, and it's a change which does work, unfortunately, the first hour or so of the film trudges through exposition in an incredibly dull way, to the point that it's treating the audience like idiots. Understandably, there needs to be appropriate build up for those who haven't seen the original film or read the book, but when information is given to us by a character using Google, it's just poor storytelling. Personally, I think it's the original film could have benefitted hugely from a remake, and while this keeps the bare bones of the story, it is refreshing that it has a new twist in the final act. I also think the acting is better in this than the original film, though Jason Clarke's character is grossly underwritten and there's a lot of unnecessary jump scares at the expense of exploring the supernatural elements or moral dilemmas at the heart of the story. I don't think this is any better or worse than the 1989 film, it's just disappointing that the story has so much more potential than both cinema versions failed to draw upon.